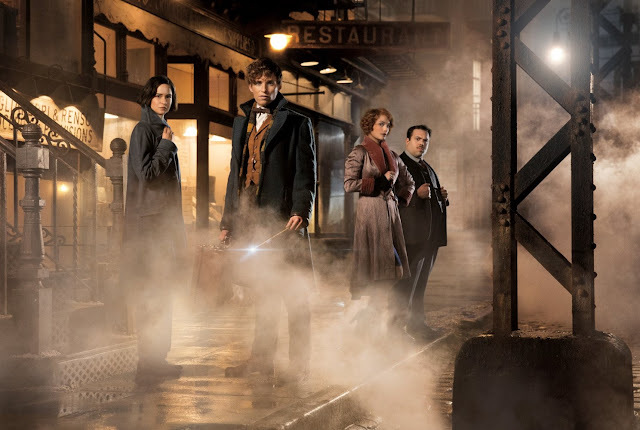 For what is mostly the first entry in a brand new series Fantastic Beasts and Where to Find Them is also very much a re-boot to the Harry Potter universe that Warner Bros. has surprisingly let remain stagnant for a solid five years. As someone who grew up with the books, who matured as they matured, and grasped the implications of the ideas and themes more as the series went on and explored more complex ideas and themes itself I have to admit to not being too thrilled by the fact Warner Bros. planned on extending the world of Harry Potter to New York City and the 1920's with a film about the guy who...wrote one of Harry and his friends textbooks? Despite the fact J.K. Rowling herself would be penning the screenplay there was still a fair amount of trepidation that whatever this Eddie Redmayne-fronted extension of the magical world might ultimately be it would inevitably be little more than a cash grab. A boardroom mandated blockbuster that would repeat as many of the same beats from the Harry Potter franchise as it could while doubling the amount of merchandise and thus the revenue. And so, here we are-the full swing of the Holiday season in November is in full force and amidst the crowded multiplexes sporting a number of high-profile releases and awards season hopefuls we again find the comfort and ease of knowing that while not exactly Harry, we are once again able to escape to the magical world Rowling has conjured up and that, no matter the protagonist, is something of an unavoidable happiness members of a certain generation can't pass up. For the truth is, after allowing my hesitations to subside and instead becoming excited by the fact Rowling and director David Yates (who made the final four Harry Potter films) reunited for a brand new chapter in the development of the wizarding world and that this chapter of the bigger picture would ultimately add more depth and scope to this world we already believed we knew turns out to be a solidly entertaining thrill ride. Though Fantastic Beasts certainly has its issues and two too many endings it casts a charming enough spell to leave audiences wanting more from the adventures of Mr. Newt Scamander and his inevitable battle with Gellert Grindelwald. 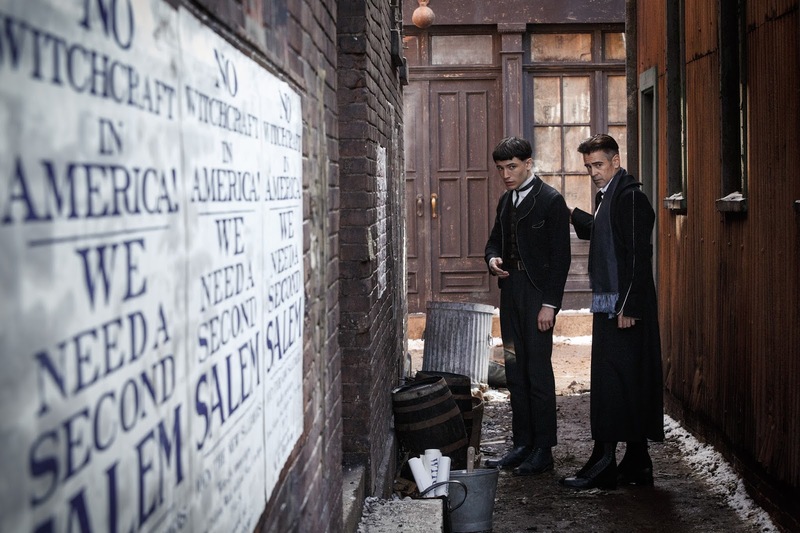 Credence Barebone (Ezra Miller) and Percival Graves (Colin Farrell) solemnly swear they are up to no good. What was always going to be the most interesting facet of exploring this new era in the ongoing battle between those in the wizarding world who wish to keep themselves a secret from the non-magic folk and those who wish to be suppressed no longer was how Rowling would tackle writing her first screenplay. Fundamentally it is a very different writing style and the approach when sitting down to craft a novel as opposed to something intended for the screen are two very distinct (forgive the pun) beasts. In this sense, I like to imagine early drafts of Fantastic Beasts were filled to the brim with descriptors that eventually bled into the set and costume designs as one of the best things this film has going for it is the presence and exploration that is allowed of this world outside the walls of Hogwarts. It is easy to predict much of the complaints about Fantastic Beasts will be due to the fact there isn't as much a real sense of place as there was in the previous series or that the 1920's New York City that Scamander inhabits is less a character in the film, but more simply a backdrop and to an extent the city itself surely could have been better utilized, but I have to think much of this comes from there being no centralized institution for our characters to default to should they get too far out of their depth. As much as the film is intriguing for allowing audiences a first glimpse of what the wizarding world looked like ninety-something years ago it is almost more so for allowing the ensemble cast of characters we meet to allow us to get to know the culture of witches and wizards at this time. Granted, none of these characters strike nearly as commanding a presence or enter the scene with as much anticipation as the likes of Harry, Ron, or Hermione did fifteen years ago, but they had millions upon millions of ideas for who they might be sprung from the millions and millions of readers that had consumed Rowling's series up to that point. Scamander has a single book Rowling wrote for charity in 2001 that not nearly as many people read and was more prominent for the fact it was Potter's copy of Scamander's textbook rather than for the fact Scamander wrote it. The point being, these new and vaguely familiar characters were never going to measure up to our idea of who we'd seen in the previous series and I don't mind giving these guys a few more movies to make more of an impression as I've already begun to warm-up to most of them. Some of them even being the reason the film ends up as fun as it does. In America, non-magic folk aren't referred to as Muggles, but are instead called No-Maj's and in the beginning of the film, after a short introduction to a clearly villainous character whom we never see from the front, we are introduced to the British Scamader (Redmayne) making his way through customs after arriving in America. He carries with him a briefcase clearly possessing magical qualities, but it isn't long before he bumps into the unsuspecting Jacob Kowalski (Dan Fogler), a No-Maj who has come to the bank looking for a loan to open his own bakery. After a string of unlucky events Kowalski and Scamander end up on the same side of the law as former Auror, Tina Goldstein (Katherine Waterston), who's looking to redeem herself with the MACUSA (Magical Congress of the United States of America) by bringing Scamander in for not only bringing questionable creatures into the country, but for not wiping the memory of Kowalski after allowing him to be privy to the possibilities of their magic. 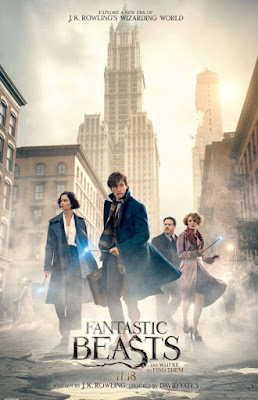 This would all be well and good enough, especially considering that once Goldstein is denounced by her commanding officers in President Seraphina Picquery (Carmen Ejogo) and head auror Percival Graves (Colin Farrell), that Goldstein, Scamander, and Kowalski team-up to help Scamander retrieve the remaining beasts that have escaped from his suitcase and are running wild in New York City with the added help of Goldstein's sister Queenie (Alison Sudol). Queenie, who is skilled in the art of Legilimency or reading people's minds, takes a liking to Fogler's Kowalski and so we'd seemingly have everything we need for a strong and entertaining narrative as the boxes of the main objective, the love angle, the railing against the established order, and a variety of archetypal characters are all at play, but one of the biggest issues with Fantastic Beasts is that it simply tries to do (or set-up) too much at once. On top of all that has already been described Rowling also inserts plot strands concerning a group who label themselves the Second Salemers or what are otherwise No-Maj's looking to expose the wizarding world. Led by a rather despicable Mary Lou (Samantha Morton) who abuses her adoptive children, namely Credence (Ezra Miller) and Modesty (Faith Wood-Blagrove), their inclusion helps incite much of the tension within the MACUSA, but their presence goes one step further as Credence and Graves have aligned for nefarious reasons that are shrouded in mystery for much of the running time. Rowling is able to balance all she has going on in an admirable fashion, but by giving herself so much ground to cover right out of the gate she inadvertently short-changes her four leads and their development despite the fact it's clear by the end of the picture that the Fantastic Beasts series won't be as much about Newt Scamander as it will be about Grindelwald and his inevitable confrontation with Albus Dumbledore. From left: Katherine Waterston, Eddie Redmayne, Alison Sudol, and Dan Fogler in Fantastic Beasts and Where to Find Them. As it is though, Fantastic Beasts and Where to Find Them is a perfectly capable blockbuster that possesses enough of the Harry Potter flair and a big enough hook in exploring other parts of this magical world during different times in the past to be nothing if not entertaining. There is easily more to be found here than just surface-level pleasures though, and much of that has to do more with the endearing human characters than that of the titular beasts. Don't get me wrong, Rowling has come up with some fun stuff as we glimpsed many a creatures in short snippets throughout the Harry Potter series, but while these fantastical beasts get their name in the title not much time is given to them in terms of how they factor into the larger story at play. Rather, these beasts are more plot devices to help our heroes get out of tight spots or adversely create opportunities for larger set pieces and comic relief as one sequence in particular that includes a glowing rhinoceros who is eager to mate feels especially tacked on. What comes to be the more enjoyable parts of the film are watching the chemistry and camaraderie develop between both Scamander and Kowalski as well as the love story that begins as something of a joke, but develops into something genuine between Kowalski and Queenie. As Scamander, Redmayne actually ends up doing a lot with a character that could have seemingly been so introverted so as to render him as little more than nothing. Rather, Redmayne's quirky awkwardness undoubtedly relates to the large number of book worms that will be present in the audience with his overall objective of writing a book to be something not taken lightly-we have a protagonist whose goal is not fame, glory, redemption, or anything so grand, but rather he simply hopes to pen a textbook. Granted, with future installments that objective may grow larger and more in line with what we traditionally expect from protagonists in large blockbuster franchises, but for now we'll count this as a win. Highlighting the inherent gawkiness of Scamander and coming to the rescue in terms of smoothing it over is Fogler in his portrayal of Kowalski. Never one to go small, Fogler takes clear joy in being the only No-Maj in the ensemble and therefore being our surrogate into this new era and area of the wizarding world. We experience the wonder as Kowalski does and Fogler does engaging work so as to put his comedic skills to good use while at the same time showing he can play real emotion by giving Sudol's Queenie an anchor to latch onto. With all of this going on, Waterston's Tina is somewhat left in the dust as her role to play within the dynamic of the plot is overshadowed by the likes of the underused Farrell as Graves and the stand-out performance from Miller. Ultimately, Fantastic Beasts will be most memorable for the fact it brought audiences into a whole new light of Rowling's magical universe that we could have only dreamt of before and that this is now a reality only makes the pleasure of experiencing it on the big screen that much more enjoyable.